To see all our Flexible PVC products see our FlexPVC Selection Guide. Before you buy the white flexible pvc pipe, please read our Application Guidelines Page. Please note: There are no returns on this custom length flexible PVC pipe so please be sure you are ordering the correct size and length. If you are buying more then 25' of any size it's usually cheaper to buy Flexible PVC Pipe by the roll. You will also find specs & dims for for this product on the Flexible PVC Pipe Specs & Dims page. 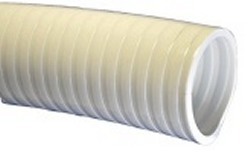 THIS FLEXIBLE PVC HOSE IS MADE IN THE USA, NOT the imported junk that will spring holes in a couple of years. 1/2 inch white, custom length, FlexPVC® brand flexible PVC pipe. Flexible PVC 1/2" by the foot. Wall thickness .12". Set the length by using the drop down boxes for feet and inches and then set quantity to the number of pieces you want to buy, and click on add to cart to see shipping. All our flexible pvc pipe is Made in the USA! and has a LIFETIME WARRANTY!